It was on a sunny morning 31 years ago today that Mount St. Helens experienced its catastrophic eruption, blowing off the top 1,300 feet from its once cone-like summit, killing 57 people and thousands of animals, and destroying or flattening thousands of acres of timber. The eruption occurred when the mountain’s north face collapsed due to an earthquake, resulting in the largest known debris avalanche in recorded history. In recognition of that unforgettable moment, our State Archives brought out this 1960 photo of St. Helens, 20 years before the huge eruption. 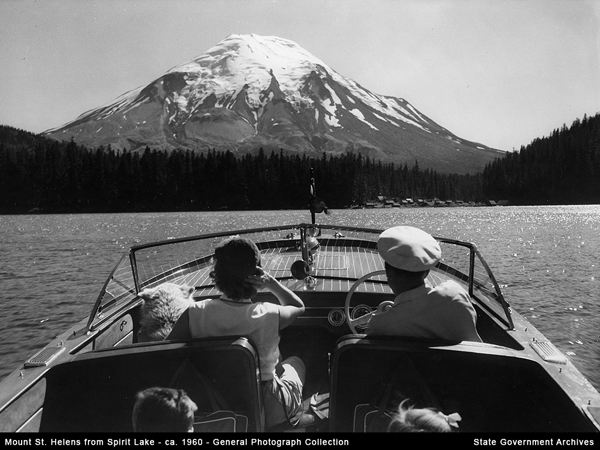 It features a family in a motorboat on Spirit Lake, located just north of the mountain. Note the cabins on the lake’s southern shore. 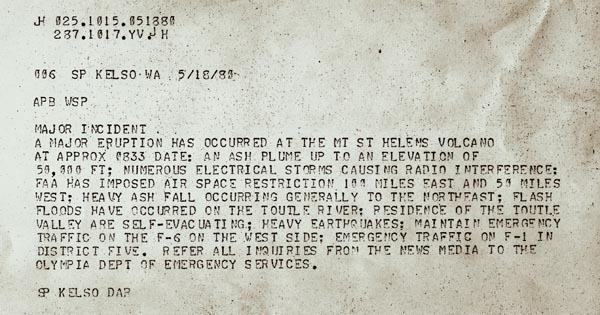 Below is the telex from the State Patrol later on the morning of May 18, 1980, announcing St. Helens’ eruption. If you want to view a stunning close-up of Mount St Helens, drive up to the Johnston Ridge Observatory, which recently opened after being closed during the winter. Go here for more info about the Mt. St. Helens National Volcanic Monument.